It’s time for some OLFA Circle Cutter tips! Are you ready? I hope so. Don’t forget to check out Part 1 and Part 2 from our OLFA Circle Cutter Series. There’s lots of good information and a tutorial too! Today’s lesson is geared towards cutting the circle rings I used in the No Name Circles table runner. These rings are a bit trickier than a normal circle. You may recall from Part 1, I told you that it’s normal for the fabric to bubble and wrinkle when you’re cutting circles. I discovered that isn’t so great when cutting a 1/2″ wide ring. If the fabric bubbles, the ring isn’t an even 1/2″ wide all the way around. Well, I have the solution…Steam a Seam! 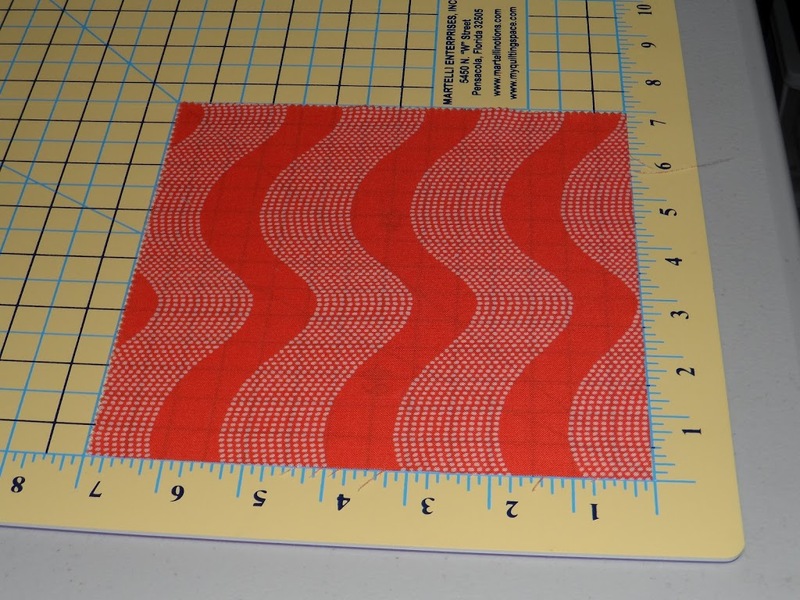 I found that Steam a Seam helps the fabric adhere to my cutting mat and keeps it from moving. I ironed the Steam a Seam to the wrong side of my fabric and then peeled off the paper backing. I placed my square of fabric in the lower left hand corner of my cutting mat and ran my hand over it. I wanted to make sure it was firmly pressed to the cutting mat. Now that it’s pressed down I can cut my circles. The Steam a Seam will hold the fabric in place and all my circles and rings will turn out perfect! I can say for certain that Lite Steam a Seam works wonderfully. I tried doing the same thing with heat and bond but it wouldn’t stick to my mat. Obviously, there are a million choices of fusibles, some cheaper than Steam a Seam, but I didn’t try them all. There could be another brand that works as well but I haven’t found it yet. I also found it was easier to cut the circles from smallest to largest. Of course, every one is different and you might find largest to smallest works best. Just have fun with it and get creative! Come back tomorrow for our final day of the OLFA Circle Cutter Series. I have one last surprise. I hope you are all enjoying learning about the Circle Cutter. It really makes circles fun and not scary! Great tip, I never would have thought of peeling off the backing of the steam a seam and sticking it to my mat before cutting. Thanks! No goo on the mat? Amazing. Thanks. Thank you! a great tip! Great tip. I am glad you tried it first!!! This is a really great series on this cutter. Thanks so much for all the good tips. Peel off the paper FIRST! Now that’s a brilliant solution. Thank you. Can’t wait to try this out. Thanks again for a great article series.